This evening after work I went out to Sol Legare Road to the Seashore Farmers Lodge #767 to take some photos for my friend James. James, Ernest and Joe are very actively involved in keeping the story of the 54th Massachusetts Volunteer Infanty Regiment alive. Thursday, July 18th, 2013 is the 150th anniversary of their ill-fated 1863 attack on Confederate Battery Wagner, Charleston Harbor and reenactors come from far and near to commemorate this event. It was the central them of the movie "Glory", a Union attempt to capture Charleston where the Civil War began. 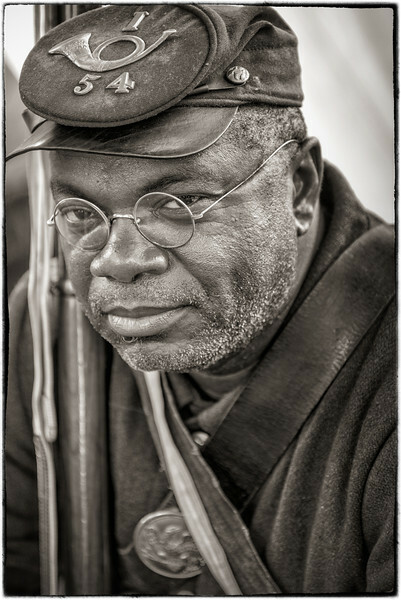 The regiment was one of the first official black units in the United States during the Civil War. The 1st South Carolina Volunteer Infantry Regiment, recruited from freed slaves, was the first Union Army regiment organized with African American soldiers in the Civil War, though many had fought in the American Revolution and the War of 1812 on both sides. I processed the images in sepia tones to give them an old fashioned look. I think it suits the subject matter much better than color.